The University of Scranton and community partners will hold the seventh annual Back to School Bonanza Community Fair together with the University’s incoming class of 2022 on Sunday, Aug. 26, from 2 to 4 p.m. at The Marketplace at Steamtown. This event is free and open to the public. Seated from left: CJ Lazor, Katrine Lazor, administrative assistant, The Marketplace at Steamtown; Anna Lazor, and Jenn Warnetsky, general manager, The Marketplace at Streamtown. Back row: Patricia O’Rourke Cummings, program coordinator for clubs and organizations for the University’s Center for Student Engagement; Gabriella Fletcher, student intern for the University’s Office of Community Relations; Jessica Durkin, administrative assistant for the University’s Office of Community Relations; Patricia Vaccaro, director of Campus Ministries’ Center for Service and Social Justice; and Julie Schumacher Cohen, director of the University’s Office of Community Relations. 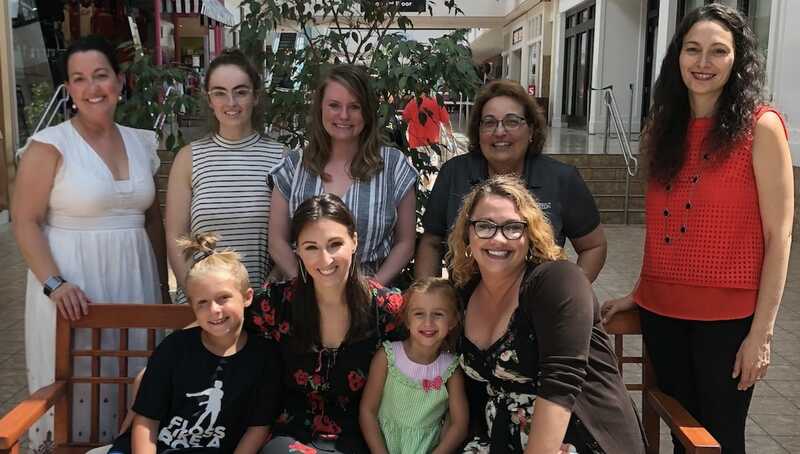 The University of Scranton and community partners will host a free “Back to School Bonanza” for children from 3 to 12 years of age and their families Sunday, Aug. 26, from 2 to 4 p.m. at The Marketplace at Steamtown. The event will include hands-on educational activities, music, games, face-painting, crafts, refreshments and prizes. Twenty family-oriented activities will be provided by community organizations and University faculty, staff and students, including several with a STEM theme, such as Neuroscience for Kids and Microscopic Exploration. The Back to School Bonanza is one of the University’s Fall Welcome activities for its Class of 2022. It is hosted by the University’s Center for Student Engagement, Office of Campus Ministries’ Center for Service and Social Justice, the Jesuit Center and the Office of Community Relations in partnership with community partners: The Marketplace at Steamtown, Lackawanna County, the Scranton School District, and other community organizations. For additional information, call 570-941-4419 or email community@scranton.edu.